Down the street and around the corner from our home in the Oregon coastal forest, we turn onto Thiel Creek Road, where just beyond the fire hydrant sits a pond no bigger than most swimming pools. 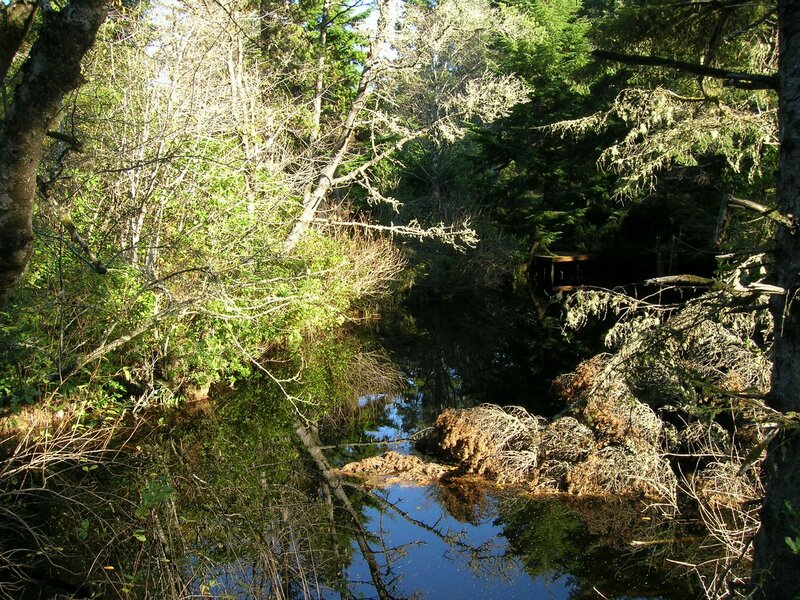 The tree-shaded pond is dark, dotted with water spiders, newts, pine needles and an dead limb that fell last winter. Two pink blow-up floaters have run aground, shriveled hunks of plastic. I always wonder how deep the water is and imagine it is painfully cold. When I walk by at sunset, the pink of the sky reflects in the glassy water, and I am glad to live so close to this piece of nature. On Wednesday, I was walking my dog Chico at lunchtime. It was a cool, clear November day, the air sweet and refreshing in my lungs. As we turned the corner, I heard a loud rustling and watched a great blue heron rise up in front of us, flying across the pond to perch on a tree, from which it sat watching us, tilting its head from side to side. Now, I am used to Stellar’s jays, robins, Oregon juncos and the occasional crow, but this huge and magnificent bird is a rare visitor whose wings seemed to reach from one side of the pond to the other. What a gift to see it even once. It was still there when we came back. We walked through trees so tall I couldn’t see the tops of them. I took the dog through his training routine. Sit, stay, come, down, yes, I mean it, down. By the time we head home, he’s slowing down, starting to match his steps to mine. As we approached the pond, the heron rose up in front of us again. This time, it flew west toward the ocean. “Look, Chico, look,” I said, but the dog had his nose on the ground, sniffing the remnants of someone’s lunch. Later, when I walked the other dog, Annie, all we saw was a squirrel, brown with a rusty chest, busily eating a pine cone. The squirrel ignored us, and Annie ignored the squirrel. On our walks, we always see something. Maybe it’s a newt slowly crossing the road, a gopher snake, wooly bear caterpillars or the black ones that look like they wear two strings of jewels. We meet the dachshund who lives just past the pond or the limping man with two basset hounds. The flora changes with the seasons from the first trillium in early spring to wild daisies, cow parsnip, and Scotch broom so yellow it glows to the fall mushrooms that look like pancakes on sticks or the ones that hang out of the mud like jingles on a tambourine. Thiel Creek Road is officially 98th Street now, and the creek is only visible here and there until we move farther east where the houses yield to forest and swamp, but every walk brings something new to see if we bother to look.